Manhattan Orthopedic Care specializes in an array of orthopedic treatments, from orthopedic surgery to physical therapy, nutrition, and athletic training. Every planned treatment is tailored to the individual needs of our patient. “My daughter was suffering from shoulder instability, and we needed a second opinion of the care she was receiving. We were referred to Dr. Armin Tehrany by a prominent hand specialist in NYC. We met with Dr. Tehrany, who was so gentle and kind to my daughter, reassuring us that he would take good care of her and he would get her well with the shoulder treatment. Three months later, she can now raise her arm fully, the scapular winging is gone and she is back to her normal routine.”, wrote John Coppola in his patient testimonial about his own daughter. 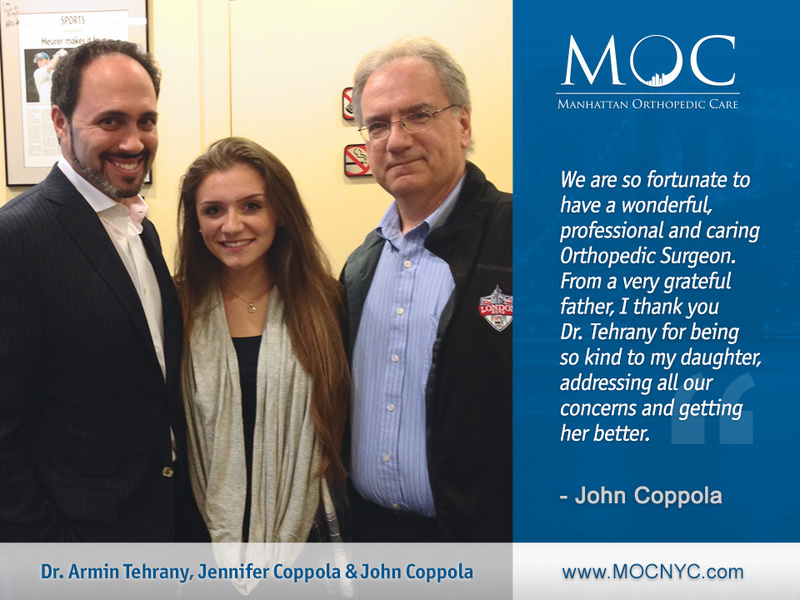 MOC’s world renowned orthopedic shoulder specialist, Dr. Armin Tehrany, made sure Mr. Coppola’s daughter, Jennifer, received the best orthopedic shoulder treatment possible. Dr. Tehrany recommended an experienced therapist who continued Jennifer Coppola’s recovery. Her father was very impressed; praising the personalized treatment and Dr. Tehrany for addressing all his concerns. “Thanks to Dr. Tehrany’s recommendation of conservative treatment, for Physical Therapy with an extraordinary therapist, my daughter is fully recovered. We are so fortunate to have a wonderful, professional and caring Orthopedic Surgeon. From a very grateful father, I thank you Dr. Tehrany for being so kind to my daughter, addressing all our concerns and getting her better. And a thank you to a very friendly staff.”, says Mr. Coppola.